I cannot find the number of my printer on your list. It's the HP Photosmart C8180 All-in One. Will HP 8200 inks work in it? Do Photosmart 8200 ink cartridges fit my printer? Crystal clear, crisp printouts are what the HP 8200 is renowned for. Eventually your HP 8200 will run low on printer ink, and when that does happen you'll notice that buying HP 8200 ink can be a costly affair. Thank goodness you have no reason to get stressed about shelling out the high purchase prices you'll get on the high street because right here at Cartridge Save you can order all the HP 8200 cartridges you'll want at ultra low prices. Start saving cash on your ink by shopping online with Cartridge Save! Why spend so much on the 8200 original cartridge or 8200 compatible ink down the high street when it's easy to save a bunch of cash ordering with Cartridge Save. You have full satisfaction when you buy PhotoSmart 8200 ink cartridges from us because they are covered by a no quibble money back guarantee. Don't forget to take into consideration that every purchase also comes with free delivery, generally arriving on your doorstep on the following working day! Aimed at photographers and graphic artists, the HP Photosmart 8200 promises high quality and true-to-life output. Its speed is certainly an improvement compared to its slow predecessors, but it is still sluggish in 'best' mode and is prone to paper feed problems. Though mainly designed for photo printing, the HP Photosmart 8200 is more versatile in handling various types of media (including plain paper and transparencies) because of the wider paper feed. It weighs 20 pounds, which makes it one of HP's heaviest photo printers. There is a 2.5-inch colour display props up on the top centre of the HP Photosmart 8200, while the control panel buttons are arranged neatly in front. Several memory card slots are integrated for direct printing. PictBridge is supported, and optional Bluetooth adapters are available. 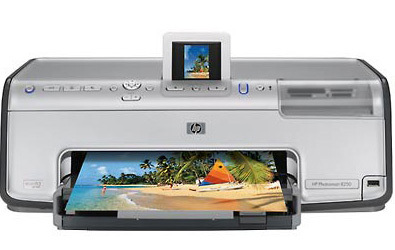 The HP Photosmart 8200 has a separate tray for printing on 4x6-inch photo paper. It is also integrated with features that allow you to adjust photos on the spot before printing. The photo print quality is excellent because of the HP Vivera thermal inkjet Inks, making the HP Photosmart 8200 really great for the serious photographer. The printer is also speedier at 31 ppm in colour and 32 ppm in black text (draft mode). A 4x6 photo will finish printing in about 14 seconds. Communication with the card reader and the PC is slow. Black texts do not come out entirely black but greenish grey. The HP Photosmart 8200's LCD display is small; even if pictures can be zoomed, users may need to move closer to be able to see details. Problems with the paper feed have been reported.